This is a pre-order. Expected ship date is June 30, 2019. This item is available for pre-order. Tyler Reddick raced his heart out at Homestead-Miami Speedway to clinch the 2018 NASCAR XFINITY Series™ championship title. Driving the No. 9 BurgerFi Chevrolet Camaro, the rookie driver performed when it counted to earn his first career NASCAR® championship crown. The title is also the second consecutive championship for JR Motorsports and the team’s third overall. Now Lionel Racing is excited to offer the official championship die-cast that celebrates Reddick’s truly incredible season. Each is built with a replica No. 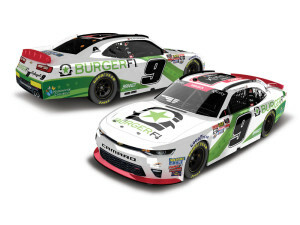 9 BurgerFi paint scheme and features the official NASCAR XFINITY Series™ Championship logo on the roof. Each 1:24-scale car also comes with a fullcolor collector card, championship confetti, and ships in a custom window box. Celebrate the 2018 NASCAR XFINITY Series™ champ. Order now! Copyright © 2019 All Rights Reserved. Musictoday II, LLC, is the seller of all Shop JR Nation merchandise and is solely responsible for all aspects of your purchase.